The annual Philharmonic Adventure Concert series has been presented to area 3rd and 4th grade students since the 1988-89 season… providing a first time music and concert experience for many of the participants. 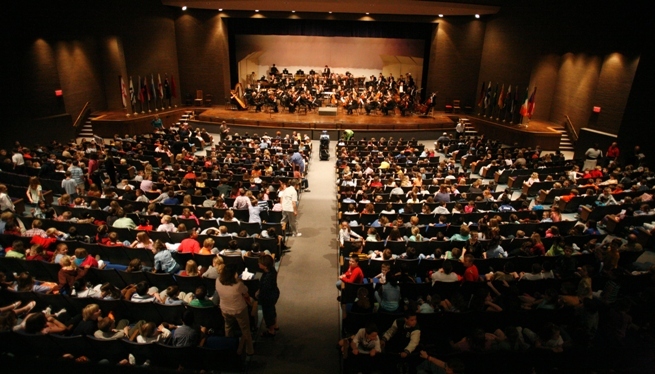 Children and educators from 32 schools in the South-Central Region of Indiana participate in the annual Adventure Concert series of programs and events. Philharmonic musicians visit area schools bringing an interactive musical experience to approximately 1600 students. The Phil’s Youth Orchestra performs side-by-side with the Philharmonic Orchestra at all three concerts and then go on to perform at an area assisted living facility and at Toyota.